The global barium carbonate market was valued at US$ 389.13 Mn in 2017 and is anticipated to expand at a CAGR of 4.2% from 2018 to 2026, according to a new report titled ‘Barium Carbonate Market: Global Industry Analysis, Size, Share, Growth, Trends, and Forecast, 2018–2026,’ published by Transparency Market Research (TMR). The market is driven by rise in the demand for barium carbonate for use in bricks and tiles in the construction industry. Asia Pacific accounts for a major share of the global barium carbonate market. With modernization, the pattern of construction has witnessed significant changes over the last few years. Demand for attractive, colored and smooth structures for buildings is on the rise. 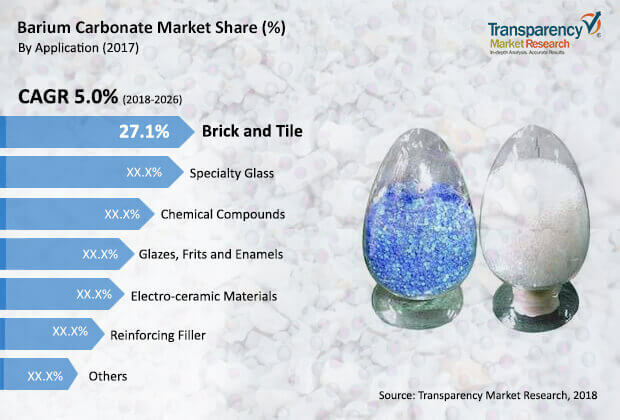 Rising use of barium carbonate in the removal of efflorescence, which is a crystalline deposit of salt formed due to moisture absorption, in bricks and tiles is anticipated to boost the demand for barium carbonate in the next few years. It is essential that masonry units be covered and left in pallets in order to minimize the risk of efflorescence throughout the construction project. Tiles are also made of the same clay or shale as bricks and they are formed into relatively thin sheets, tubes, or hollow blocks. Bricks is a highly important building material used in construction activities in developing economies. Increasing use of barium carbonate in multi-layered ceramic capacitors, fuses, PTC thermistors, piezoelectric transducers, sensors, dynamic RAM, MEMS, optical modulators, and electromechanical devices is likely to boost the demand for barium carbonate in the electro-ceramic materials segment. Advanced electro-ceramic materials have played a significant role in advancement in technologies such as computers, telecommunications, and aerospace. Increase in use of barium carbonate as a raw material in the manufacture of positive temperature coefficient (PTC) thermistors is likely to boost the demand for barium carbonate during the forecast period. Glazes, frits, and enamels contain barium carbonate. Barium carbonate is a major source of barium oxide, which is used in glazes, wherein it functions as a flux and helps in producing matte finish. Barium carbonate ensures a good fit between the glaze and the surface that it covers, thereby enhancing the chemical and mechanical strength of surfaces. Thus, the ability of barium carbonate to impart superior finish is likely to offer growth opportunities to the barium carbonate market in the near future. Since the late 2000s, CRTs have been largely superseded by flat panel display technologies such as LCD, plasma display, and OLED. Several large manufacturers of television sets have stopped making CRT-based sets. With the transition toward flat-panel monitor and television technologies, consumption of CRT devices is expected to decrease over the time. With the decreasing demand for CRT, the demand for barium carbonate is also likely to decline in the near future. Among various forms, the powder segment dominates the global barium carbonate market. Powder form of barium carbonate is used in the ceramics industry as a fluxing material to produce matt glazes, specialty glasses, clay bricks, and tiles. It is also employed in the production of barium peroxide, barium hydroxide, and barium chloride. Most manufacturers operating in the barium carbonate market are engaged in the manufacture of powder form of barium carbonate. Among regions, Asia Pacific accounted for a major share of the global barium carbonate market in 2017. China is the key producer of barium carbonate in Asia Pacific. In most countries of Asia Pacific such as China, India, and countries in ASEAN; governments have taken initiative for new infrastructure projects. Rising investments in the construction industry in the region are anticipated to fuel the demand for barium carbonate in the region during the forecast period. Several market leaders such as Hubei Jingshan Chutian Barium Salt Corporation, Guizhou Red Star Development Co., Ltd, and Hebei Xinji Chemical Group Co. Ltd. operate in the Asia Pacific market. Key players profiled in the report include Guizhou Red Star Development Co., Ltd, Hubei Jingshan Chutian Barium Salt Corporation Limited, Sakai Chemical Industry Co., Ltd, Chemical Product Corporation, and Vishnu Chemicals. These players are forward integrated and they account for a major share of the global barium carbonate market. Brand promotions and launch of new products are likely to boost sales of barium carbonate in the next few years. Market leaders are striving to adopt measures such as strategic pricing and product improvement to gain market share.